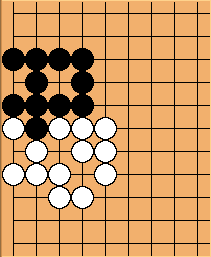 This page shows several example situations and attempts to apply the Ing ko rules to them. It is intended to illustrate that it's difficult to know exactly how to apply the rules to these examples by only reading the rules. The following refers to the ko rules section of the Ing 1996 Rules. Is the ko a fighting ko or a disturbing ko? If one looks into the official examples, this is answered easily. However, can it also be answered from the ko rules themselves? The fighting ko rule says: "A fighting ko determines the life and death of the opposing groups involved." Even if one does not know exactly the difference between life and death, it is ultimately clear that the adjacent groups have life. Even though "group" is not defined in the rules, we may reasonably assume it to mean "one or several strings of the same colour considered together". Which strings? Those "involved". Although the rules do not say what that means, in this example we may as well pretend to understand it. The only related difficulty is whether also the ko stone shall belong to the considered groups. If it did, then each ko stone in each ko would always have to be considered and then all ko stones would always be part of fighting kos. Therefore obviously the ko stone is not part of the considered groups. It also makes no sense to consider nothing but the ko stone because the rule speaks of "opposing" groups. Thus we consider the big strings in the example diagram and whether they are in a fight that determines their life and death. They are not because they have life. Hence a literal reading of the fighting ko rule leads to the conclusion that the ko is not a fighting ko! One might now also study whether the ko would be a disturbing ko according to the rules text, but for us it is already sad enough that a literal reading of the rules text does not let it be a fighting ko. What about an informal reading of the ko rules? It would have to ignore the sentence "A fighting ko determines the life and death of the opposing groups involved." because it is hardly possibly to bend it enough for getting the desired application to the example. The sentence would have to be: "A fighting ko might or might not determine the life and death of the opposing groups involved." That would be as if the sentence were not in the rules at all. Why do Ing Ko Rules call a triple ko a fighting ko? This is an arbitrary rules design. It might equally well have been called a disturbing ko (more precisely: disturbing death, where the black stones are dead). After one cycle, nothing is changed. If a triple ko were called a disturbing ko, then Black's move 7 might not be another ko capture in the triple ko. I.e., some time White could remove the black stones. This would be pretty intuitive, wouldn't it? The side with 1 liberty and being on the verge of removal would be dead while the side with 2 liberties for his big string would be alive. ThorAvaTahr: Your statement here is very confusing, it is clearly black's turn in this position and after a single capture of a ko stone white would be, what you call, "on the verge of removal". So the most natural way to treat this group, as I see it, is to call this a fighting ko, as do the ING rules. RobertJasiek: This is another possible view. (And the Japanese / Chinese / Korean one is yet another possibility.) But it is not a priori clear why either view should be preferable. When classifying kos into types at all, one might declare it to be either a disturbing ko or a fighting ko. It is also possible to achieve the effect without explicit classification. E.g., the Basic-Fixed-Ko Rules make it a disturbing ko while a superko rule makes it a fighting ko. Maybe Ing was still under the impression of superko, where a triple ko behaves like a fighting ko? Contrarily, Japanese and Chinese long cycle tradition is quite unlike fighting ko. The rules mention the particular shape class "triple ko" explicitly in the rules: "In a triple ko fight, besides the single hot stone there is another single or double ko stone; these are also regarded as hot stones, known as twin hot stones." So if something is as easily identified as triple ko as in this example, one can determine the ko type as "fighting ko" by simply looking into the rules text. The difficulty is rather the necessiety to remember that triple ko and eternal life are treated as precedental shape classes in the rules at all. However, classifying a shape due to precedental exception is unnatural and therefore hard to understand and remember. Just to be sure - since the example shape is a fighting ko according to the rules, White 2 may not be a ko capture in the triple ko. Is this a "triple ko fight" according to the rules or are these three fighting kos instead of only one fighting ko? If it should be a triple ko fight according to the rules, then White may not immediately reply at either square. If it should not be a triple ko fight according to the rules, then - presumably - White may not immediately reply at the square but may reply at circle. The rules do not tell us whether the fight in the example is a triple ko. ThorAvaTahr: Seems to me like a simple ko, no triple ko involved here. I am not sure, how exactly the ING rules would work in this situation, but there is no reason to fight a ko over three groups here, since the sizes are identical. Normal play would be to capture or defend one group by both players and fight ko over the third group. If i am frustrating your argument here, I am sorry, but I am not sure what exactly it is that you are trying to demonstrate with this situation. RobertJasiek: The problem is: The Ing Ko Rules do not have any explicit basic ko rule. So by saying "looks like a simple ko" we do not know yet which board plays might be prohibited. - You are right that under non-Ing-ko-rules there is no need to fight over three kos here. But the Ing Ko Rules do not have a rule "If there is no need to fight a ko, then everything is allowed.". The players might want to play through the three kos nevertheless. And as long as we don't know exactly which moves are allowed / prohibited, we cannot know whether under Ing ko rules strategy might be different and a fight about the three kos becomes possible. We can only be sure if we know about exactly which moves are allowed. So application of the Ing ko rules ought to be clear also for this example position. But it is not. - The rules use the phrase "triple ko fight". To us, it is unclear what is or is not a triple ko fight. You suggest this example is not while I suggest this example might be. I.e., we have identified an interpretation difficulty of the rules: What exactly is a "triple ko fight"? ThorAvaTahr: Ah! You are arguing here that the ING rules are incomplete and not properly bounded. (Sorry, I did not understand the title right.) Even though my knowledge and study of the ING ruleset is limited, undoubtely less then yours, I would like to agree to this. Nevertheless I do like the effort that ING made to design a firm ruleset. In principle I do not object against classifying different types of ko in order to prohibit cyclic behavior ("invariancy") for some rare complex ko-situations. I do think that the fighting-ko / disturbing ko distinction can be a big step in the right direction, although the rules as they are now do not sufficiently define these terms. 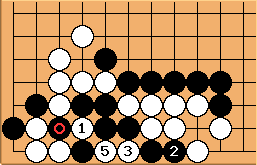 The ING rules lack a lot of formal definitions, even the goban is not properly defined (only later as equipment). Perhaps after some discussion it can be possible to write a proposal for changes. It seems to me that ING is willing to improve the rules. I don't know if anybody has any experience with that? RobertJasiek: The Simplified Ing Rules are a proper definition, but they use superko, i.e., not what Ing would have liked. The superko therein can be replaced by something else, e.g., the Basic-Fixed-Ko Rules. With that, normal basic kos are fought (fighting ko) while everything else behaves like a disturbing ko (incl. triple ko, eternal life, pendulum ko, and molasses ko). If you want explicit ko types, we can define: "A fighting ko is one basic ko. All else is a disturbing ko, which may contain fighting kos." But for the Basic-Fixed-Ko Rules, such a definition is superfluous. - Of course, one could also define fighting ko differently to include triple ko, eternal life, pendulum ko, and maybe a few more. However, if one wants to be correct and precise, then necessarily such makes the rules much longer and more complicated. Bill: See Ing-Spight Ko Rule for a proposal based upon the idea that all stones played in the ko are hot. It could use the fighting/disturbing ko distinction, but is stated more simply without doing so. RobertJasiek: Ing-Spight, Basic-Fixed-Ko, 3-plays-ko-rule, etc. are all attempts to provide clear, precise, and correct ko rules in a way that avoids the potential strategic complexity of superko-like rules. However, all those as well as Ing's disturbing ko rules fail to prohibit "unnecessary test" cycles. 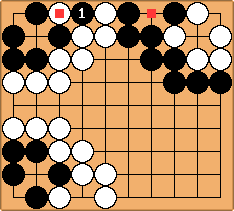 The Ing fighting ko + hot stones rules have a potentially intersting idea: to avoid as many superfluous moves as possible. In case of disturbing kos, this would mean: Prohibit all ko captures (if not: all plays). What is still missing is ko rules for this purpose. Bill: What do you mean by an unnecessary test cycle? RobertJasiek: Some cycle that is played to invoke a cycle detecting rule but might as well not have been played for the same strategic effect. Example: Under Ing Ko Rules in a quadruple ko starting from a stable state, playing the cycle abcdef is strategically essentially equivalent to not playing in the quadruple ko at all. Bill: I do not think that Ing-Spight rules have such cycles. RobertJasiek: Maybe your intention differs but I read their "ko rule" to look back rather than forward. You define "hot stone" by using past perfect. Also it refers to a sequence of plays in a ko, where ko refers to a basically even cycle. Now, cycle is defined by "may repeat"; ok, now this sounds like looking forward. However, here you run into the any stone is a ko stone problem (except that you interfere with odd cycles, but considering the nature of my proof, this is only a weak condition). So I think you actually may not look into the future with that generality. If you restricted the future to a small constant number, say, 8, I would have much less fears. Bill: Hot stones are defined using the present perfect tense, because they have been played in the current ko. You have to look back to the start of the ko. As for the "any stone is a ko stone" problem, the fact that passes are not ko plays avoids most of that problem. Suppose we could decide the ko type question of example 3. Even then we will be in trouble here. Is there a triple ko fight? Are there several, overlapping triple ko fights? Or are any possible triple kos dissolved by becoming a quadruple ko and therefore - presumably - a disturbing ko? ThorAvaTahr: Here again, if there was no triple ko in the previous example in the first place than this would not be a question at all. RobertJasiek: Can you tell precisely which move-sequences are allowed and which prohibited according to the rules? Whether something would be called triple ko here would be only of secondary importance if there was not the reference to triple ko in the rules text. Suppose that example 4 is answered by "The presence of a fourth ko on the board transforms a triple ko into a quadruple ko, i.e., a disturbing ko." Would this also mean that the triple ko here is a fake, is a quadruple ko in fact, and suddenly becomes a disturbing ko? The rules do not tell us. Supposedly this is a disturbing ko. However, it is unclear from the rules whether the move 1 does disturb the disturbing ko. 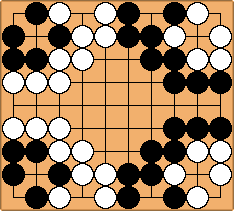 If Black 1 should be considered to "disturb", then with 7 Black might not immediately continue to disturb. I.e., in this position, Black would have to play elsewhere (on a larger board) or pass. If the rules should not consider Black 1 to disturb the disturbing ko, then surely they would consider White 2 to disturb the disturbing ko. I.e., White instead of Black would be the disturber. If so, then this continuation would still be allowed. Now White might not immediately continue to disturb. The rules do not tell us whether either Black 1 or White 2 is the first disturbing move. So we cannot know whether the rules restrict either Black 7 or White 8. Nor do the rules tell us whether the initial position was an instable intermediate state of a disturbing life or a stable state of a disturbing death. Bill: Is this a disturbing ko? I don't find anywhere else that this is called a disturbing ko. Bill: By the Ing/Spight rule, after all of , , and are hot, and White may not capture without passing or playing a non-ko move. Bill: But even if White does take back later, after all of - are hot, and White may not continue. Ing also considers this a disturbing ko, but does not have hot stones in a disturbing ko. @ . takes and . This position, inspired by a real game, appears in the Yuan translation of the Ing '96 rules (but not in the Chinese version). It is classified as a disturbing ko because of the recycling of ko threats ( and ). But such moves would be considered ko moves in eternal life. Why do they become ko threats here? Bill: By Ing-Spight rules is hot and cannot be immediately captured. Page contents: RobertJasiek, additions by others.